YoYoFactory - Gentry Stein Signature Plastic Yo-Yo! The new YoYoFactory Replay PRO is the latest yo-yo in the World Champion Gentry Stein line of signature yo-yos, and it is fantastic! "It has been a long term goal and dream of mine to have my name behind a low price plastic yoyo. I am happy to say that this has now come true. The thing is, the new YoyoFactory REPLAY PRO doesn't play like a low price plastic yoyo. It plays levels beyond any yoyo the market has seen at this price level!" We couldn't agree more - This is one of the top performing plastic yo-yos we have played with lately. Gentry has been working with the YoYoFactory design team since December 2014 to perfect his new yo-yo and you can just feel all the time they put into the design when you throw the Replay Pro. Fast, stable, and maneuverable with crazy spin times and a really comfortable feeling in hand - The Replay Pro has everything you're looking for in your next throw. 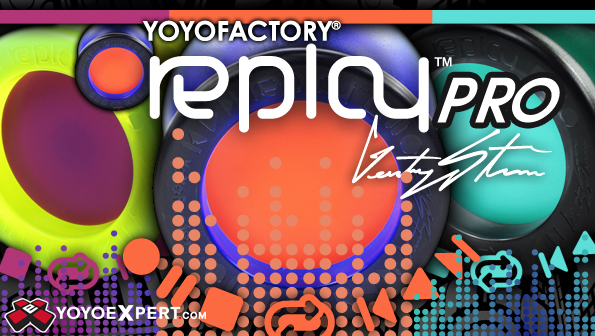 The Replay Pro outplays just about any yo-yo in it's price range and once you start throwing it you'll completely forget that you're shredding through your hardest combos with a $15 plastic yo-yo!